We were delighted to welcome Professor Becky Reuber (University of Toronto) to the NUI Galway on Friday 5th April. Becky drew on her editorial experience at the Journal of International Business Studies (JIBS), Academy of Management Perspectives, Journal of Business Venturing and Entrepreneurship Theory and Practice, to provide frank and insightful advice on publishing qualitative research in academic journals. The talk focused on many issues including responding to reviewer requests, engaging with editors and presenting qualitative data and methods. Click here to view the slides. Each seminar features a senior editor from a highly-ranked Business/ Economics academic journal, with a chaired discussion and Q&A session. Refreshments provided to facilitate networking and informal discussion. 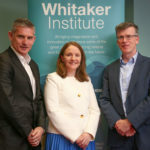 • To assist colleagues across the Whitaker Institute and JE Cairnes School of Business and Economics to gain insight into publication strategies and techniques, directly from those who edit top journals in the field. 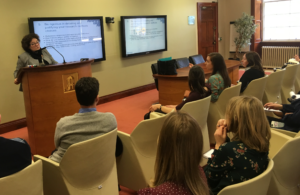 • To align with School accreditation aims, and NUIG’s Vision 2020 goals of: ‘publishing in high-impact journals’ and enhancing the ‘quality, impact and international awareness’ of our research. • To complement existing discipline-level seminars and research mentoring activities. • Additionally, journal editors to be invited as stand-alone seminars: we will rotate through the disciplines to ensure broad representation. To see upcoming seminars in the series, click here.